Lucio Fulci’s MANHATTAN BABY isn’t a great movie. As is often the case with Fulci’s pictures, the acting is wooden and the pace a little slow. But Fulci chooses this time around to de-emphasize the over-the-top gore for which he was infamous and concentrate on atmosphere with generally successful results. An archaeologist is in Egypt doing research. He has brought his wife and daughter along with him on his journey, and they spend their time wandering around the ruins while he digs up ancient artifacts. After falling into a secret tomb (resulting in the impalement death of his guide in one of the movie’s few moments of on screen gore), he is rendered blind by a ray of light that comes from a jewel embedded in the wall. Meanwhile, his daughter meets a mysterious old woman who gives her a jewel studded amulet before disappearing into thin air. Back in New York, the girl starts becoming ill and having nightmarish visions. Her creepy little brother seems to take this all in stride, as he himself has had out-of-body experiences which he always thought were just a part of life. It is implied that the reason the girl was chosen as a recipient of the amulet is her and her brother’s “sensitivity.” Doctors are at a loss as to what is wrong with the girl. Finally, an exorcist explains that she is under the influence of an evil Egyptian demon who has not yet possessed her, but is trying to. He agrees to exorcise the demon from the girl by bringing it into himself, but unlike Father Karras in THE EXORCIST, he may have less than righteous motives for doing so. Unfortunately for him, the demon isn’t about to lend itself for his own selfish use and brings his stuffed bird collection to life which tears him to shreds. While there are obvious nods to THE EXORCIST and ROSEMARY’S BABY (the exorcist’s name is Adrian Mercato), the movie never really becomes a rip-off, as it takes the borrowed aspects of those previous movies in unexpected directions. There are some ambitious metaphysical plot twists which unfortunately suffer from limited special effects capabilities, a few of which are similar to better-executed sequences in POLTERGEIST (though the movies were released almost simultaneously). The stuffed bird attack at the finale is the movie’s gore highlight, and while many viewers have complained about the phoniness of the birds in the scene, I think the sequence works in a surreal, nightmarish way. I love THE BEYOND, but the pipe-cleaner spiders looked ridiculous. Here, the obvious artificiality of the birds makes them that much more creepy. Overall, MANHATTAN BABY is worth a look. 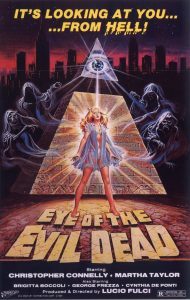 I can’t bring myself to give it more than a 6 out of 10, but fans of Fulci’s work might be interested to see him show off his flair for atmosphere and style instead of gut-munching and eyeball-popping.